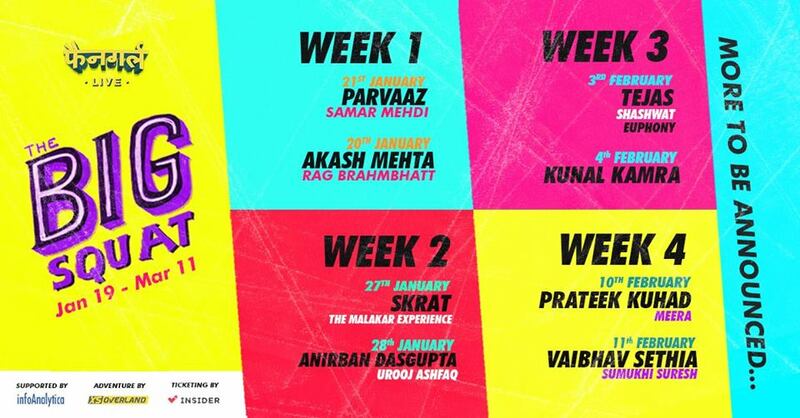 An 8-week long Entertainment Festival is Coming To Ahmedabad! That’s right! Top names in standup comedy, spoken word poetry and music, with some food and music for a whole 8 weeks, right here in Ahmedabad! Read on for details! An art squat is a name used to describe the action of artists to occupy (or squat in) an abandoned building, thereby creating studio space to create art. After an exhilarating first season in 2017, featuring concerts across Gujarat and making the state’s first truly all-independent music festival – spanning across 2 days and 2 stages – Fangirl is back. Bigger, better, fresher. Pesh hai The Big Squat! An effort spanning 8 weeks (yes! ), starring 32 handpicked artists from the Indian Independent Circuit. The exciting format features standup comedy, films, spoken word poetry, food and of course – music! All week – Food, Popup stalls, Poetry, etc.